Get sophisticated and stylish lighting with this stunning swing arm wall lamo. 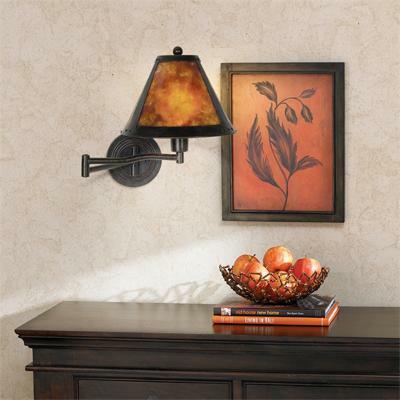 A warm and appealing swing arm in the classic Mission, Arts and Crafts style. The design features a distressed bronze finish and a beautiful Mica look shade. The adjustable arm helps you direct light where it's needed, making it ideal for reading or other tasks. Plug-in style wall lamp installs easily. • Backplate is 6" wide. • 25 1/4" maximum extension. • Shade is 4" across the top, 11 1/2" across the bottom, and 8" high.